Confession… I love made for SyFy movies. They are my guilty pleasure, and I make no apologies for it. Yes, they are usually cheesy, oftentimes poorly done, and laughable special effects. But I love them nonetheless. Recently SyFy aired Sharknado. You know, a tornado that occurs over/around the ocean that picks up a bunch of sharks and scatters them about to wreak havoc over poor unsuspecting bystanders. How does one prepare for a Sharknado? 1. Make and carry a reinforced umbrella. It would be heavy, but if you are in actual fear of a sharknado, better safe than sorry. Not to mention it would come in handy for other heavy fallen debris. 2. Chainsaw. If you have a chainsaw you can just cut the sharks right out of your way. Tee-hee. 3. Carry a harpoon. You can easily harpoon those flying sharks. 5. Chuck Norris. 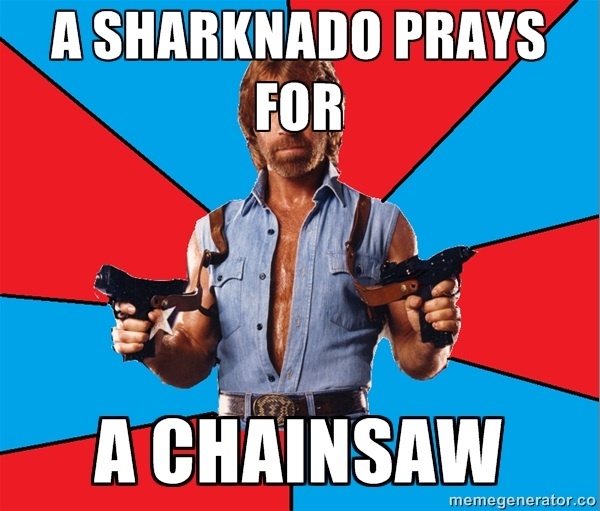 Yep, run around with Chuck Norris, because the sharks will pray for a chainsaw instead of Chuck Norris. I want to add that I do not think sharks being picked up by tornadic activity and hurled at humans would actually be eating you, though. You might die from the impact, I guess. Oh, and for my fellow SyFy movie lovers, Tara Reid confirmed that she will be in ‘Sharknado 2’. GAH — sharknado!!! I feel so sorry for Tara Reid! Oh Chuck Norris, it’s only fitting that he’s a part of this whole thing! Ha! I saw the tweets about this, and I can’t stop LAUGHING! I think my favorite was “All the jokes about a sharknado will make people not take it seriously when it really happens.” BWAHAHAHAHA! I try to stay away from the TV during Shark Week and this whole “Sharknado” thing. Living in Florida with access to the beach I really don’t want to know how close they are or any of that stuff LOL!!! I would rather stay ignorant and enjoy my day at the beach. HEHE yeah that never happens I know they are out there!! Hubs and I always crack up when we see the Sharknado promos. I am going to have to watch Sharknado! Omg I am obsessed with Sharknado and I just laughed out loud with the Chuck Norris meme. Love it. TOO FUNNY. I didn’t watch it, now I think I’m going to have to! I would want the harpoon, or Chuck Norris, of course. Sharknado would be perfect for Bad Movie Night with my BFF since I missed it not having cable anymore, LOL! I haven’t seen that Sharknado movie that everyone is talking about, but this is a fun post! ROFL I haven’t seen the movie but how can you not laugh at Chuck Norris! Oh no, now you’ve given SyFy Channel that idea… I won’t be surprised to see Whalenado, now. LOL! My husband has been itching to see this movie, but I told him he’s on his own! I watch horribly bad movies all of the time just for the laugh factor, so I might end up watching this if it shows up on Netflix. lol Okay that’s hilarious. I haven’t seen Sharknado but I’ve seen enough of it on The Soup to get pretty much the entire movie. LOL. That is hilarious! I’ve never of a Sharknado before.